Move over little black dress...it's time for the little black jumpsuit. And this Leota Lizzy jumpsuit in black crepe is simply amazing....but then again, Leota is amazing! Leota makes the cutest clothes in the dreamiest fabrics and prints. The company is also near and dear to my heart because they donate clothes to Uncommon Threads. Yep, they're kind and generous too! So let's talk about why this jumpsuit is so fabulous. The fabric skims without being too clingy and is wrinkle-free (great for traveling--in Quebec City here). The deep V neckline is so flattering and the simple style can be dressed up or down. Perfection! 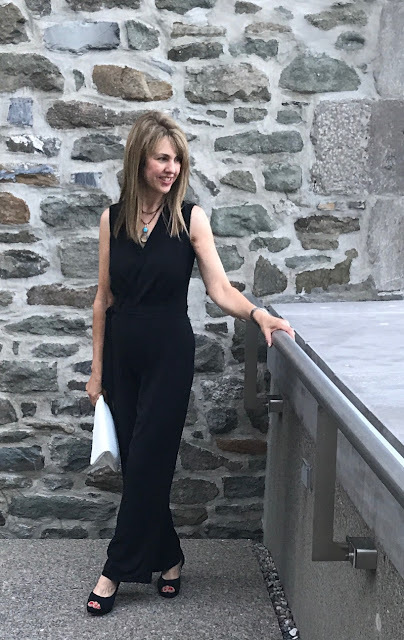 I paired the jumpsuit with an incredible necklace from Emily Kuvin Jewelry Design that can be worn four different ways--one strand, doubled, doubled with a pendant or as a bracelet! I encourage you to take a peek at Emily's website--she is so so talented! 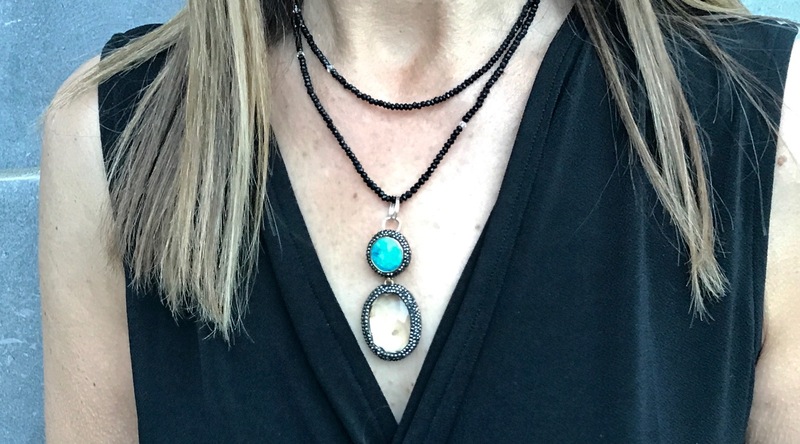 I love that her jewelry works for most budgets too, from splurges to gorgeous earrings starting at just $48.00! And while we're talking about fabulous companies, these super comfy Sara pumps are by Adrian Allen Shoes. Adrian Allen is also another generous and kind business-- they also donate shoes to Uncommon Threads! How lucky are our clients to have such beautiful and comfy shoes? And you can be lucky too! Code MIDLIFEFASHIONISTA will get you 20% off (ends August 7, 2017). These are the perfect "go with everything" pumps! 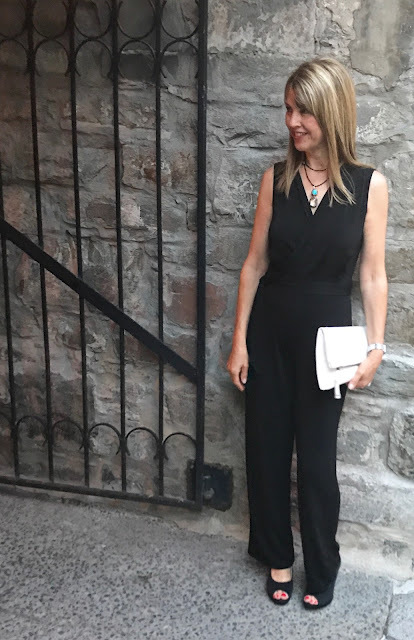 This jumpsuit can be worn pretty much all year round. As a matter of fact, I can't wait to throw a leather jacket (on sale!) over it in the fall with an edgy bag (just $24.98!). For the summer, I added a white clutch to keep things light. Similar clutches HERE ($33) and HERE (under $40--love the tassel!). Emily Kuvin Jewelry Design and Adrian Allen Shoes! 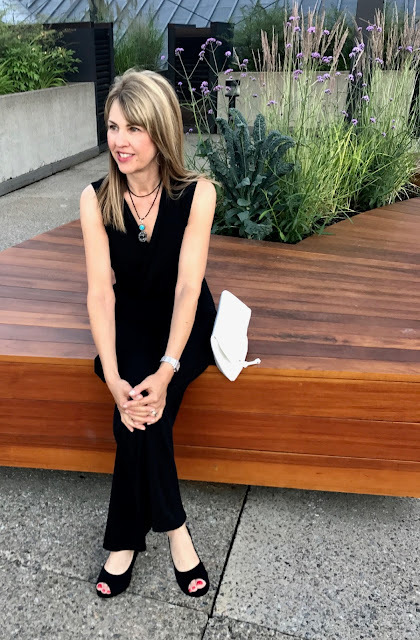 The Adrian Allen shoes, Leota jumpsuit and Emily Kuvin Jewelry Design necklace were gifted and some of the links generate a small commission. However the content of my posts are based on my own honest opinions and are not in any way influenced by partnerships. I only post what I love! You look fantastic! 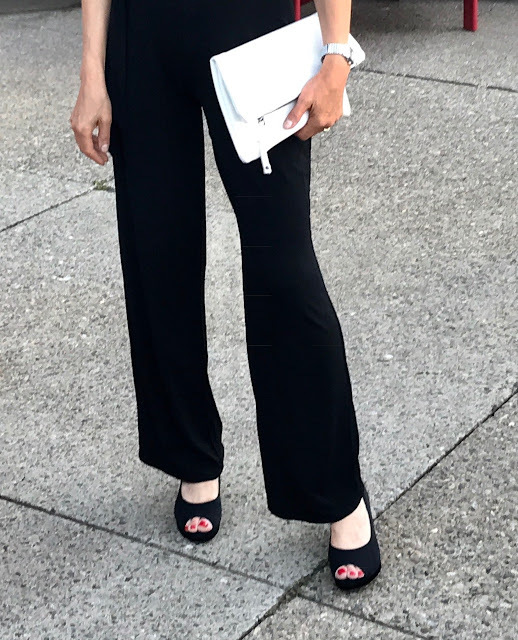 You are rocking that jumpsuit! And I really love the necklace! You looks so young, let me guess your age is about 35?